Easy & Free Tip Calculator and Bill Splitter that does not use your data plan! 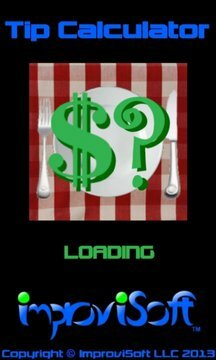 Enter the amount of your restaurant bill and a 15% tip and total payment amount is automatically calculated. Use the tip percentage slider to change the tip percentage. Easily divide the "Total to Pay" among multiple people. Tap the arrow buttons to increase or decrease the number of people paying. Holding the arrow buttons down will increase or decrease the party-size by four people at a time (the first hold-increase makes it a party of 4). Use the "Round Up Tip" checkbox to increase the tip to the next highest dollar. Use the "Round Up Payments" checkbox to increase the amount each person pays to the next highest dollar. 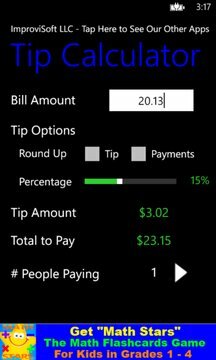 When using either of these buttons, the tip will be increased, and the resulting tip percentage is displayed next to the adjusted tip amount. v1.1 includes an App menu bar that makes it easy to pin the app tile to your Start Screen, provide feedback, and find ImproviSoft's other apps & games.